We’d love your help. Let us know what’s wrong with this preview of The House of Fiction by Susan Swingler. To ask other readers questions about The House of Fiction, please sign up. Yeah. 8 May - advised that I am to receive a First Reads copy of this book, which is one I would have bought anyway. How good is that? Can't wait for this one. Elizabeth Jolley is one of those names in literary circles, particularly here in Western Australia. She is right up there with Tim Winton, with Patrick White, with Helen Garner, giants of Australian literature. To not appreciate her work is to be, in the Yeah. 8 May - advised that I am to receive a First Reads copy of this book, which is one I would have bought anyway. How good is that? Can't wait for this one. Elizabeth Jolley is one of those names in literary circles, particularly here in Western Australia. She is right up there with Tim Winton, with Patrick White, with Helen Garner, giants of Australian literature. To not appreciate her work is to be, in the eyes of many, an absolute philistine. Well, philistine that I am, when I read a newspaper article about a forthcoming book, Susan Swingler’s House of Fiction, which promised to expose Elizabeth Jolley as living, for years and years, a lie, of stealing another woman’s identity, of even stealing another child’s identity for her own daughter, I was intrigued. I wanted the dirt, and I wanted it dished up in great dollops. Forgive me if that makes me sound a tad nasty, but there you have it, and at least I’m being honest. Of course, the book immediately went into my mental list of “Must buys”, and I had every intention of purchasing a copy. And then – one of life’s lovely little gifts – I was advised by our lovely Goodreads that I had actually won a copy of the book from the publishers, Fremantle Press. Of all the competitions I enter to win a book – and there are many, I assure you – this was without doubt the one that made me most happy. Not wanting to even wait for the postal service to deliver it, I ventured down to Fremantle Press’s lovely old premises and eagerly collected my prize, brought it home, put the kettle on for a nice cup of tea and settled down with what I was sure was going to be a great read. You know, what really struck me as soon as I began reading Swingler’s book was that these were real people I was meeting on these pages; this was not an episode of Home and Away or Neighbours, but flesh and blood people with real emotions, real foibles, real insecurities and failings. I found that I wasn’t quite as eager for gossip as I had thought myself to be. At its base, the book relates how newly married Susan Swingler, an English woman, discovered, quite by accident – as most discoveries do occur – that a giant lie had been perpetuated, and that 12,000 miles away, in Australia, her father and step-mother, Elizabeth Jolley, had carried out, for many years, a deceit of massive proportions. In her own words, Swingler talks of how layer after layer of lies was peeled back, and of her search for answers as to why and how things became as twisted, and indeed sordid, as they did. At the time when Susan was conceived, little did her mother, Joyce, know that her good friend, Monica Knight, was not only the lover of her husband, Leonard Jolley, but that she was, in fact, already pregnant with his child. Monica let Joyce believe that the child she was carrying was the child of a terminally ill doctor she knew through her work as a nurse. Not only did Joyce accept this story, she even took Monica into her own home, and in due course the two little girls – Susan Jolley and Sarah Knight – romped together in the yard, loved by their mothers and their father. Reading the book, and the letters which are contained within it, there can be little doubt of the love that Leonard felt for Monica and for their child, Sarah. It was, I believe, inevitable that he would leave Joyce and start a life with Monica. That is exactly what he did, and they set up home together, playing happy families with their little girl. Ah, if only it ended there all would be fine. Let’s face it, that scenario is played out all over the world on a daily basis, and it is not up to anybody to judge those involved. No, this story takes a strange, and I think incredibly cruel, detour now as Leonard and Monica decide to allow friends and family to believe that the family unit still consists of Leonard, Joyce and Susan. Confusing? Mm, indeed. Having to leave behind her home, all her toys and the things she loves, Susan is taken by her mother to a new life in a boarding school in the south of England. Her father has promised her that he is off to Scotland to find a new job and a new home for them, and he will come back for her as soon as he is settled. This little girl waits, and waits, and waits, never stops waiting. Through financial deprivation, cut off from any family support, Susan never loses faith that her father loves her and will return for her one day. She even receives parcels from him, but he never comes back. How could Leonard come back? He and Monica – who has changed her name from Monica Knight to Elizabeth Jolly – are now living in Perth, Western Australia, raising their daughter, Sarah, and in due course other children, Richard and Ruth. Leonard is doing very nicely as a librarian of some note, and Elizabeth’s literary star is in the ascendency. Leonard’s family, still unaware that the woman he shares his life with Down Under is not the woman they know as his wife, send parcels and letters addressed to Joyce, and of course to the girl they think of as their granddaughter and niece, Susan. And there in Australia, Elizabeth receives these gifts and letters, and she responds to them all, thanking those family members for their kindness, and passing herself off in her correspondence as Joyce. She goes so far as to send photographs of Sarah but with Susan’s name written on the back. She sends postcards to the real Susan’s grandfather, signing them as Susan. This stuff is right out of an Oprah Winfrey show – no, worse than that, it’s like something from Jerry Springer. But his isn’t Oprah or Jerry; this is the story of one woman’s discovery of some really, really bad behaviour on the part of one of the greatest names in Australian literature. Nobody can sit in judgement on others. Nobody can decide on a writer’s literary worth based on their personal lives or beliefs. And you see, that’s where I have a problem with this book. I wonder why it was written, and why it was published. I can see that the writing of The House of Fiction would be very cathartic for Susan Swingler. I cannot begin to understand the pain and the feelings of abandonment that she must have felt at times once the truth started to emerge – and many of her questions remain unanswered – and I am truly impressed by the lack of bitterness in her writing. Having said that, if Monica Knight had never become Elizabeth Jolley, if she had spent her working life teaching English literature in a high school, or as a CPA toiling over annual reports, would this story have ever been anything more than perhaps a self-published memoir, read by a small group of people? I don’t think so. I think that this book is one which people will buy and read simply because it concerns a literary icon. I’m never sure whether it’s a good idea to know too much about our heroes, be they singers, actors or writers; far safer – and less of a dilemma - to simply judge them only by their work. So, how is the book? Did I enjoy the book? Well, the book is okay, and that’s about as far as I would go. The writing is not wonderful, but it is not bad either. It is, in my opinion, too long and too self-indulgent in places. Too much time is taken up with a sort of “What Susan did”, “What Susan did next”. It is at times quite repetitive, and at others there are inconsistencies, the sort which jar as you read them, which you know don’t gel with something you read earlier but you just can’t put your finger on exactly what it is that doesn’t quite add up. I’m really glad that I won this book; I’m really glad that I didn’t actually have to buy it. I have read it, and I’m glad I have read it because it is a book which I wanted to read. But now, this is one of those books which I will gladly pass on to somebody else, and I will happily assure them, “No, don’t bother giving it back to me. Pass it on to someone else, or give it to the op shop”. Susan's story stayed with me long after I started reading another. Susan's very moving account describes years of deceit perpetrated by her father and step mother seemingly so her father would not have to face criticism by his family. As a result of the secrecy surrounding her father's affair and subsequent abandonment of his wife and child Susan was denied access to her extended family and all the love that could have been shared throughout her childhood. Susan writes beautifully and generously Susan's story stayed with me long after I started reading another. Susan's very moving account describes years of deceit perpetrated by her father and step mother seemingly so her father would not have to face criticism by his family. As a result of the secrecy surrounding her father's affair and subsequent abandonment of his wife and child Susan was denied access to her extended family and all the love that could have been shared throughout her childhood. Susan writes beautifully and generously invites us to follow her painful longing as repeated efforts to reach out and know her father are rejected. That Susan was repeatedly abandoned by her father is tragic not just for Susan, but for her father also who never got to know her as we the reader do. For around 20 years I'd counted Elizabeth Jolley as one of my favourite authors. She still is, of course, and is one of those authors whose books I dip back into from time to time to learn about the power of words, and how less is more. When I first heard of The House of Fiction a few years ago, I know I wasn't alone in being shocked by this story. Jolley had (I know now) a carefully constructed persona of the mild, somewhat staid English woman, a self-effacing writer who was flattered by her suc For around 20 years I'd counted Elizabeth Jolley as one of my favourite authors. She still is, of course, and is one of those authors whose books I dip back into from time to time to learn about the power of words, and how less is more. When I first heard of The House of Fiction a few years ago, I know I wasn't alone in being shocked by this story. Jolley had (I know now) a carefully constructed persona of the mild, somewhat staid English woman, a self-effacing writer who was flattered by her success. It's taken me a few years to get around to reading House of Fiction, and once I started I could barely put it down. 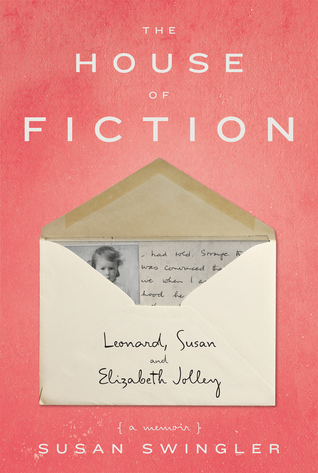 Whether or not you've read Jolley's writing, House of Fiction stands as a fascinating memoir. Swingerl is a deft and thoughtful writer. There are no tantrums in this book, no accusations or threats. It is above all a measured and deeply affecting book as Swingler excavates through her past to try and unravel the secrets and lies that were woven around her. As a memoir it is fascinating. The way Swingler handles the various threads and materials, and unfolds the events both pasts and present, is brilliantly done. This is memoir at its best. Swingler doesn't look to blame or seek to hurt but only to understand. Her writing is compassionate and even handed in that she thoroughly investigates, to the best of her ability with the material she has access to, all sides of the story. Swingler aims for truth, or as much of it as she can achieve. An extraordinarily moving family saga told sensitively and without malice or bitterness. "I think that a child's love for a parent must take an enormous amount to destroy, and despite everything I had learned, I couldn't let go of this childish love". Who, I wonder, is the real Elizabeth Jolley? This review has been hidden because it contains spoilers. To view it, click here. I began this memoir immediately after reading the cooked seed by Anchee Min. These could not be two different memoirs. I didn't read the House of Fiction to compare nor did I make comparisons other than to think that these memoirs dealt with different types of lives and perspectives. The House of Fiction has been described as drawn out in a few reviews I read before beginning the book. I would say yes drawn out, but not repetitive. I think everyone was just waiting for the end. Waiting to find ou I began this memoir immediately after reading the cooked seed by Anchee Min. These could not be two different memoirs. I didn't read the House of Fiction to compare nor did I make comparisons other than to think that these memoirs dealt with different types of lives and perspectives. The House of Fiction has been described as drawn out in a few reviews I read before beginning the book. I would say yes drawn out, but not repetitive. I think everyone was just waiting for the end. Waiting to find out if all the authors questions were answered. The ending was not disappointing and I cannot say that in that situation I would have done better. BUT some things had to be speculated in the end because unfortunately at the time of writing the majority of the people that are the main focus of the mystery have passed on. Susan Swingler writes with clarity and I enjoyed her style of writing. She presents the novel as a type of mystery and each chapter just leaves you with a little bit more information to lead into the next section of her life. I liked that it followed chronological and it didn't involve lots of short little memories of random times (I have to admit here I am comparing to the Cooked Seed, which had paragraphs of little life snippets). It read like a novel but sadly was this lady's life of wondering why her father left her when she was so young and forced her mother to raise her as a single mother. Also why his family had thought that he had never abandoned them to move to Australia with his new wife. Its an interesting novel that shows her life as both happy, but confused why her father had acted as he did and the later part of the novel analysing his new wife who had also been her mothers friend. Every family has secrets - it's just a whole lot more interesting when you are reading about the bizarre back-story of a well-known author. This book is partly about Elizabeth Jolley - writer of fiction and, as we discover in this book, creator of real-life fiction which that impacts on the writer of this text Susan Swingler. In 1967, when Swingler married in England at the age of 21, she received congratulatory cards from an aunt and an uncle she didn't know she had. When she asked about these Every family has secrets - it's just a whole lot more interesting when you are reading about the bizarre back-story of a well-known author. This book is partly about Elizabeth Jolley - writer of fiction and, as we discover in this book, creator of real-life fiction which that impacts on the writer of this text Susan Swingler. When I first heard about Elizabeth Jolley, she was nothing more than a character in someone else's story, namely, English professor to Perth musician David McComb. It was long after I'd finished "Vagabond Holes", the anecdotal biography of David and his band, the Triffids, that I even figured out Jolley was not only an author, but a venerated one in quite a few Anglo-Saxon countries (although my home country, Germany, clearly does not fall into this category). I picked up a couple of her books, When I first heard about Elizabeth Jolley, she was nothing more than a character in someone else's story, namely, English professor to Perth musician David McComb. It was long after I'd finished "Vagabond Holes", the anecdotal biography of David and his band, the Triffids, that I even figured out Jolley was not only an author, but a venerated one in quite a few Anglo-Saxon countries (although my home country, Germany, clearly does not fall into this category). I picked up a couple of her books, which I enjoyed, and stumbled, coincidentally, as is my habit, across Susan Swingler's "House of Fiction." One genre I particularly enjoy is detective novels, and from the description, this was nothing short of a good mystery! I really enjoyed this powerful and moving memoir - it had all the elements I need to keep me engaged and interested - strong characters, a great story and several well known identities (Elizabeth Jolley to name but one). We all have skeletons in our family closets, but the Jolley Family secret is a doozy and one so well hidden, it took Susan 40 years to uncover. A moving, thought provoking novel that has forever changed the way I perceive the works of the late Elizabeth Jolley. Oh my goodness, this is a great read. It should have been called Secrets and Lies if Woody hadn't claimed that title years ago. It tells the story of the deceit, lies, fraud, family secrets and inexplicably secretive behaviour inflicted on their families by Elizabeth and Leonard Jolley over many decades. Leonard's daughter Susan Swingler manages to remain sane as she works through this web of intrigue. An arresting book. Fascinating memoir about family secrets. As this one involves a famous Australian author its intriguing to wonder how much of her personal life and the secrets influenced the writing. My only criticism - I thought the author was too balanced and sensitive! I wanted her to be more angry but that's me pushing my values onto the author and expecting her to feel the way I would. Highly recommended. I would probably give this book 2.5 stars but should not really rate it as I did not quite get to the end. This was the latest from our book club group. Although I found the story quite intriguing it kept going along at the same pace, not really getting anywhere. Was probably very theraputic for the author. It was a bit drawn out but having seen a tv show about the story (Australian Story on the ABC) I really wanted to read the book. It left some questions unanswered as the author herself hadn't felt comfortable in confronting her father to find the truth. An amazing but very sad true story. Elizabeth Jolley was my favourite Australian author and I have read over the years all her books. This book talks about Elizabeth and husband Leonard and their behaviour towards Leonard's first wife and his daughter. I found it an interesting book and an enjoyable read. Such composure and grace in the face of deceit... Yet characters you'd love to hate come across as flawed humans seeking redemption as best they know how. A refined and meticulous work; I'll go read more of Jolley now. An interesting biography and a great true story of deception by one of Australia's leading authors - although in the end I think she meant well - it took me 4 days to read it! Was heading towards four stars but it went on and on and on in the end. Average writing, but fascinating story and very brave, respectful and honest account of a life thwarted by family secrets. Fascinating read & very enjoyable. Has prompted me to read more Elizabeth Jolley, & from a different viewpoint.